The market formed a clear 3-wave decline, followed by what so far looks like a corrective rally, so the two counts with the highest probability are those of a double zigzag and of a flat correction. In the first count, our previous main count is perfectly intact with small modifications to its targets. The second count is now presented as our new alternate count. EURUSD is expected to find support between 1.1201 and 1.1177, while remaining below 1.1257. If the market moves upwards, EURUSD is expected find resistance between 1.1251 and 1.1274. Either way, the market should remain above 1.1123. 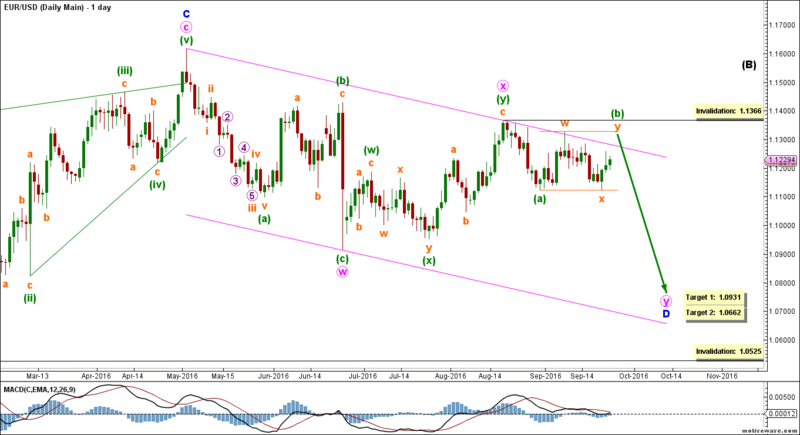 Elliott Wave chart analysis for the EURUSD for 23rd September, 2016. Please click on the charts below to enlarge. Within it, green wave (b) is most likely forming a double combination labeled orange waves w, x and y. 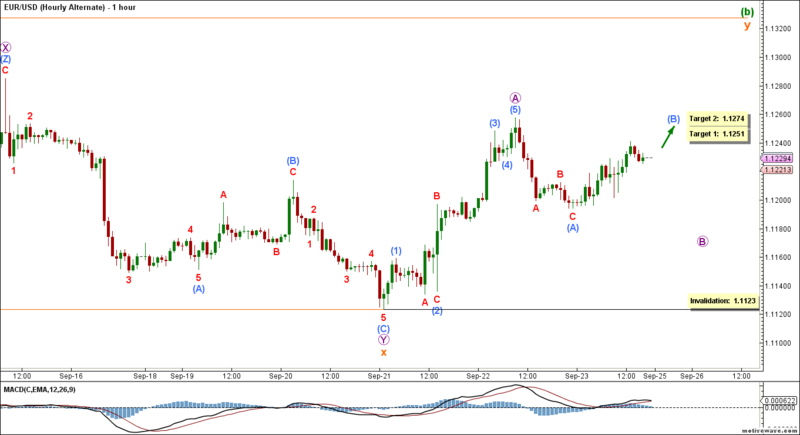 This main count sees that orange wave x is complete and that orange wave y is unfolding towards the upside. Orange wave y is forming a zigzag labeled violet waves A, B and C.
Within it, violet wave A formed an impulse labeled aqua waves (1) through (5). Violet wave B is forming a double zigzag labeled aqua waves (W), (X) and (Y). Within it, aqua wave (W) is complete and aqua wave wave (X) is either complete or near completion. 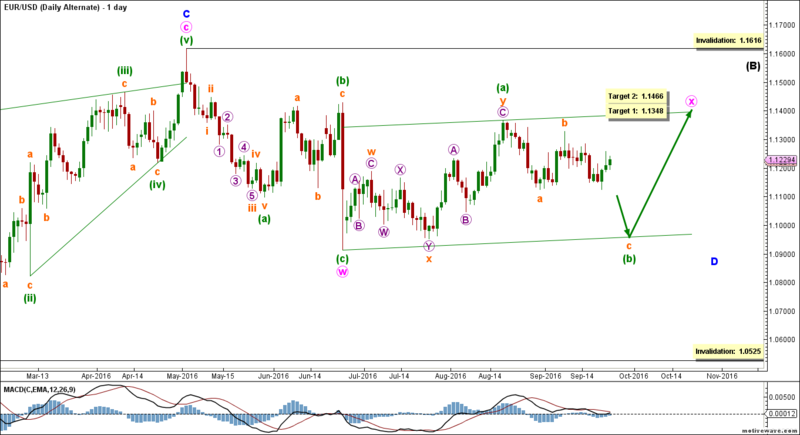 This count expects the euro to move towards the downside in aqua wave (Y) to complete violet wave B. This will be confirmed by movement below 1.1201. At 1.1201 aqua wave (Y) would reach 61.8% the length of aqua wave (W), then at 1.1177 it would reach 100% of its length. This wave count is invalidated by movement below 1.1123 as violet wave B of this zigzag may not move beyond the start of violet wave A. It is also invalidated by movement above 1.1257 as aqua wave (X) of this double zigzag may not move beyond the start of aqua wave (W). This alternate count sees that violet wave B is forming a regular or an expanded flat labeled aqua waves (A), (B) and (C). 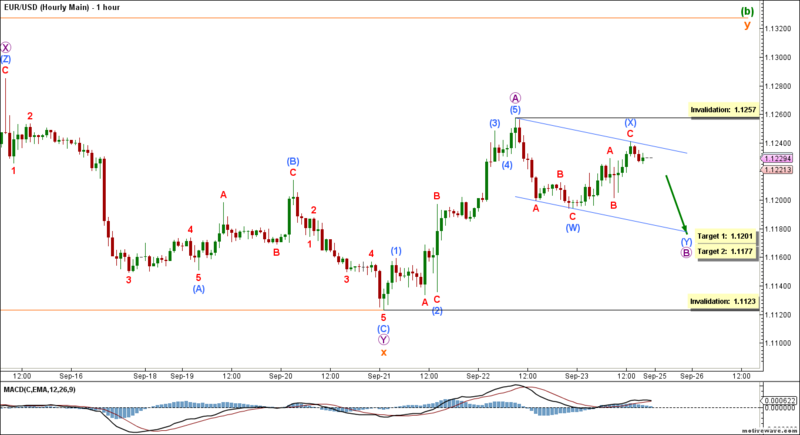 Within it, aqua wave (A) formed a zigzag labeled red waves A, B and C.
This count expects the euro to move towards the upside in aqua wave (B). At 1.1251 aqua wave (B) would retrace 90% of aqua wave (A), then at 1.1274 it would retrace 127.2% of its length. This wave count is invalidated by movement below 1.1123 as violet wave B of this zigzag may not move beyond the start of violet wave A. Well, since confirmation & first targets are at the same levels, there is just nothing to be traded here. Unless you would want to do grid-Martingale trading, as that approach will most likely trade all of these (endless) rebound… so for the moment that may indeed seem profitable up, or down, it wouldn’t matter…. However, based on EWA counts, I would not even start to think of putting trades in right now. There is just NO nice move to trade. 1) would it be possible to show the “targets” at their actual levels, instead closely “on top of each other” as is shown now? You see, as presented currently on the charts, target 1 is always WAY off from the actual target1-level (for quick screening this may give a totally false impression). I don’t know whether this is possible to achieve with MotiveWave, or not. Great suggestions, as usual, John. I’ve already started implementing them in today’s analysis. The charts look a little odd to me, probably because I’m used to the old layout. But I’ll leave them like this for a couple of weeks and see how other members react to them. Thanks a lot for the excellent feedback, John. 1. You’ve labeled the first section (yellow 1-5) as a leading diagonal, but wave 4 is so far away from wave 1, whereas a diagonal typically exhibits overlap between the two waves. 2. You’ve labeled red waves a as LD and red wave c as ED. And while there’s no rule that says this can’t happen, it’s very strange that both would occur in the same wave, since even motive waves should exhibit some form of alternation. 3. In both yellow wave a and red wave c, the wave relationships are not what you would expect in a diagonal. For example, in yellow a, wave 3 is larger than both 1 and 5. And in red c, even though it’s not complete yet, 3 is larger than 1 but 4 is smaller than 2. So neither of them can be properly labeled as a typical diagonal of the “contracting” or the “expanding” type.